(TBZ8N7) Not another Micro! 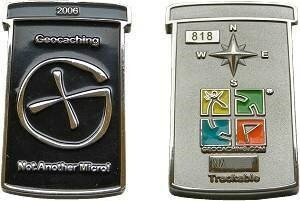 Geocoin - Not another Micro! Use TBZ8N7 to reference this item. Im Januar 2006 brachte Oakcoins diese 28 x 45 mm große, 4 mm dicke und 32 g schwere Filmdosen-Geocoin in 3 unterschiedlichen Versionen heraus. Als 3. Version gibt es eine Nickelcoin, deren Vorderseite im Camouflage-Design gestaltet ist. Gallery Images related to Not another Micro! Mal ein anderer Micro - tatsächlich!! Und schon so ein alter! Habe vielen Dank für diese Geocoin und sei herzlichst gegrüßt. Discovered it. Thanks for sharing. Discovered at the Geowoodstock events. Sorry you couldn't bring your stash of amazing coins with you!! That would have been super amazing to see all the way from Europe. Thanks for sharing and taking the extra effort to type ALL of these up. Kudos to you! !